If you are a crazy sports fan and want to engage yourself into the big leagues and tournaments around the world actively, the fantasy sports give you a chance. In fantasy sports, you can choose any types of sports, and when the big leagues are there, you can run your league with your friends with reputed players and make a big score. The excitement and fun of the game are unlimited, and it will give you immense pleasure to have your team. So, if you have the skill to manage a sports team and have always dreamt to get included into the thrill of the games, fantasy sport will give you the opportunity. Now, when it comes to fantasy football, the TelegraphFantasy will always be the leading name. From the super leagues to the big prize amount, TelegraphFantasy is there to raise the temperature of big leagues like world cups and all. Here, you can select your favorite players to make your team; but you have to be strategic enough to ensure your win. The game is great fun and beginners will never get confused as the rules, and terms of the game are very simple. Once you know the ways to play it, you can make a great score and win lucrative prizes. Are you beginning this season? You will be amazed to know that your initial TelegraphFantasy football team is free of cost! There is more to raise your excitement. Do you know what you can get if you win? There are over 120,000 pounds of prize money you can win while playing TelegraphFantasy. To secure your win and to help you to make effective strategies, we are here today to provide perfect plans. You just need to be smart enough and think before making your team. The basic feature of TelegraphFantasy football is to pick the best team to win. You need to pick the best team from the Premier League, and that’s why you need to watch every match minutely. You can start the game with $50, and it will be needed to buy eleven players for six formations. You will depend on the selected players who are playing originally in the FA League or Premier League throughout the season. Your aim should end the season to be on the top of the league table and score as high as possible. 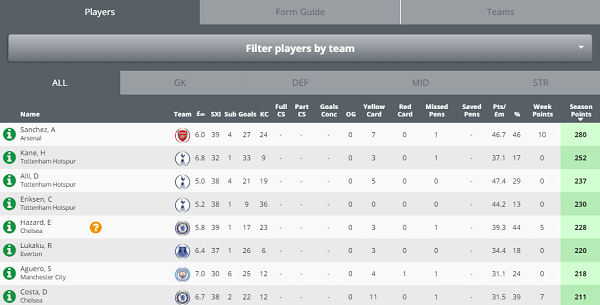 The players you select can get scores based on performance, making goals, and keeping clean sheets. But, if your players get yellow or red cards for the original match, you will lose scores too. While you are playing TelegraphFantasy football, you can stay updated as you can watch the original matches while playing at their Live Match Center. How to Select Your Team? You can select your eleven players by clicking on their name on the player's list. Each player has a separate value, and you need to pay for them. The entire value of your team must be 50 pounds or lesser than that. You can select players in a 4-4-2 formation or 4-3-3 formations. There is a column header which consists of players list. Click on it, check out the players there and pick players for your team by their value, performance in the last season and which club they play for. While selecting players, you can compare up to five players before making your decisions. To compare your players, you need to tick the boxes against each player names. Once you made your final selection and your team is ready, you need to give a name and then register. You should remember that you can change players of your team as much as you like and whenever you like but within 12.45pm on Saturday, August 16th. After that, you can go for 30 transfers. Once you choose your final team, you can go for 30 transfers throughout the season. Transfers are needed to replace suspended, injured and under-performing players with new players with full of energy. You can do five transfers in one scoring week. It is the main aim of playing TelegraphFantasy is to score higher at the end of the season to top the league table. While appearing in the starting 11, players score 2 points, and again they score 1 point appearing as a sub. Once your selected player score goals in the original game, you score 5 points and player that assists goal can score 3 points. Defenders and Keepers with clean sheets can score 4 points, and when they start as a sub, they score additional 2 points. With each goal by any players, deduct 1 point from defenders and keepers. For bookings, 2 points are deducted from your player while red card deducts 5 points. Things become more complicated when 5 points are deducted from a player, who missed a penalty. On the other hand, a player gains 5 points by saving a penalty. If a player is awarded man of the match, he gains 3 points. All these points are scored only in FA Cup matches and the matches of Premier League. Playing TelegraphFantasy Football League is quite simple and full of fun. You can easily pick players and make your dream team and set a private league with your friends. It is super exciting to run your private league and to get over your pals while enjoying the live matches together. And the lucrative prize and awards are the glue that sticks you to the league. If you are the winner, you will be refunded all your money at the end of the season. If you are completely new to the fantasy football, TelegraphFantasy league will provide you with lots of alluring prizes and awards at your winning. Still, if you don’t win, the adrenaline rush at every game, making strategies, planning to win and be on the top of the league table will keep you excited during the league.